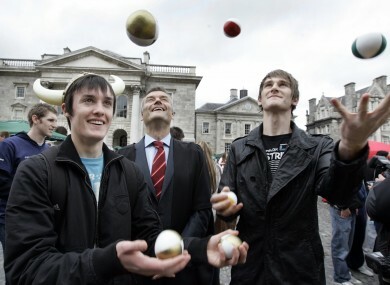 Students mark Freshers Week at Trinity College last year: TCD remains Ireland's top-ranked university; Ireland still has three institutions in the top 200. THE WORLD RANKINGS of Ireland’s top universities have remained largely unchanged in the latest rankings from education company QS. Trinity College remains Ireland’s top-ranked university, ahead of University College Dublin, while University College Cork cements its spot among the world’s top 200 universities. Trinity is ranked at 67 – down two spots from the 2011 rankings – while UCD is up three spaces to 131. University College Cork, which made the top 200 for the first time in 2010, is down by 9 spaces but remains at 190. NUI Galway is up 11 spots to 287, while Dublin City University is up two notches to 324. The University of Limerick is unchanged from last year, given a ranking between 451 and 500, while NUI Maynooth kept its slot in the 501-550 category. Queen’s University Belfast had the best improvement of the island’s nine universities, jumping 27 places to 166. The University of Ulster is not graded. Massachusetts Institute of Technology is declared the world’s best university, with an overall score of 100, just 0.2 points ahead of the University of Cambridge which is in second place. Harvard University is in third, on 99.2, while University College London is at 98.7. Trinity College’s score, by comparison, is 71.3, while UCD totalled 59.1 and UCC managed 50.2. The colleges’ overall scores are based on their relative rankings in five academic disciplines: Social Sciences & Management, Natural Sciences, Life Sciences & Medicines, Engineering & Technology, and Arts & Humanities. Separate rankings from QS – listing cities in terms of their quality of living, affordability, employment activity and student mix – puts Dublin as the ninth-best city in which to study – ahead of the likes of Barcelona, Munich and New York. Paris is considered the top city in which to study, leading London, Boston, Melbourne, Vienna, Sydney, Zurich and Berlin. Email “No major changes for Irish colleges in latest University rankings”. Feedback on “No major changes for Irish colleges in latest University rankings”.